Across the street from the office of Jacqueline Johnson, archivist for Oxford’s historic Western College for Women, is a small amphitheater where she can break for meditation and reflection. A curved bench faces semi-circular rows of rugged Indiana limestone and provides a view of foliage beyond. It’s a little sanctuary within the Western campus, which itself is part of ever-growing Miami University. But this haven isn’t a retreat from reality. Instead, it’s the understated and somewhat-underappreciated Freedom Summer Memorial, which pays tribute to a time, 50 years ago this month, when Western played a crucial role in events that forever changed the nation. The inscriptions on the memorial recall just how dangerous Freedom Summer was—Molotov cocktail explodes in basement of Sweet Rest Church of Christ Holiness; Civil rights car hit by bullet; Students told to watch out for Klan. Some are actual newspaper headlines from the era. The most chilling refer to three young men who came to the first week’s training session, left for Mississippi before it was finished, and soon went missing. Their disappearance haunted the second session. That August the bodies of James Chaney, Andrew Goodman, and Michael Schwerner were found near Philadelphia, Mississippi. Their deaths helped galvanize the nation to force the South to end institutionalized racism. Miami plans a special 50th year recognition of the three, says former university architect emeritus Robert Keller—something that will complement the existing memorial. “It helped plant Western’s role in civil rights history,” says Johnson, standing near the amphitheater and as proud of her employer as if she had actually founded the school. 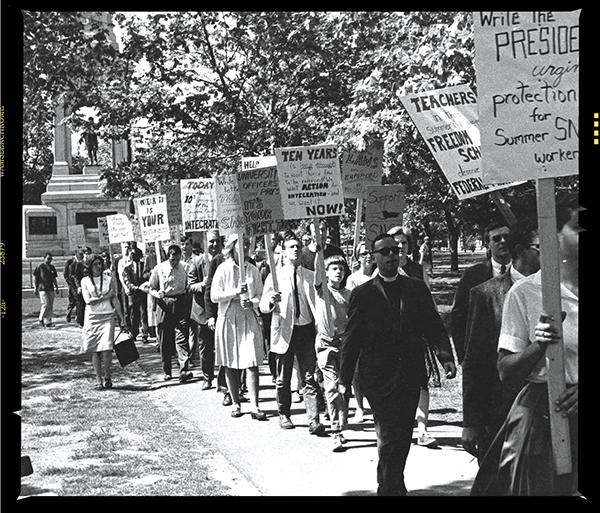 Last year, she edited the book Finding Freedom: Memorializing the Voices of Freedom Summer (Miami University Press), about the 14-year-old memorial. Western, which started as a female seminary in 1855, merged with Miami in 1974. “When I was at Western the community had its racial sensitivities, so I was really surprised when I heard the college was hosting,” she explains. “As a student, I was well aware the community had not had that much interaction with African-Americans.” Still, she has visited and guest-taught there since. “I’m very proud of Western,” she says.